“Aja Michael-Keller” may not sound familiar to you, but it’s pretty likely you’ve seen her around campus. 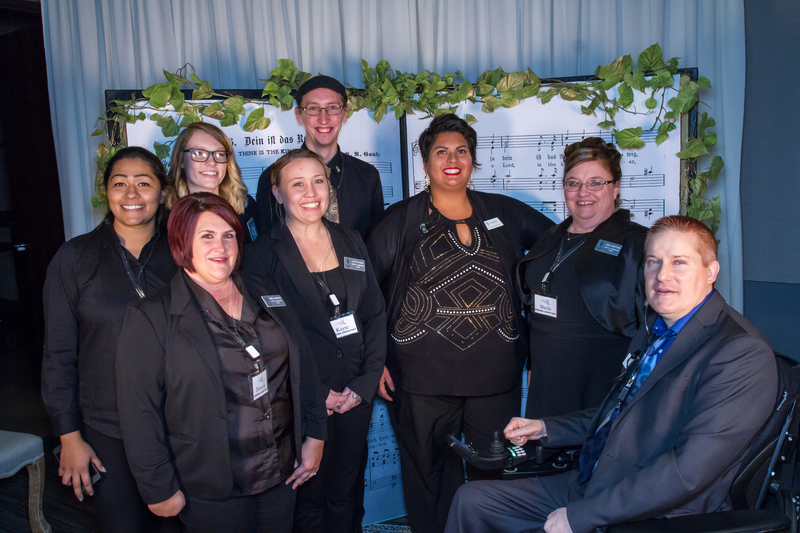 Whether she’s helping Ivy Tech put on a great event or teaching students about the ins and outs of convention management, she’s been a fixture at Ivy Tech for seven years. How would you describe your job to students? I’m part of the marketing team on campus, and I work with all kinds of folks to make sure the community and possible students see Ivy Tech as the place to go. I’m also responsible for pulling off some of the College’s biggest special events including fundraisers like “A Reason to Taste” and commencement. I also plan non-credit IvyLiving classes that show off our faculty and facilities to the community. If that’s not enough, I’m also an adjunct instructor in the Hospitality Administration program. I teach event management courses, and I love spending time working with my students who geek out about events like I do. Aja Michael-Keller, third from right, and her Intro to Convention and Meeting Management students at last year’s A Reason to Taste fundraiser. Where would students likely have seen you around campus? The best event planners are like ninjas: They dress all in black, and you never know they’re there. But, if students happen to have caught me, it was probably when I was barking orders during event set-ups or going from meeting to meeting all over campus. Sometimes, I represent the College on the news. They usually make me go on the 5 a.m. live interviews no one else wants to get up for. Full make-up, hair, and suit coat are tough before the sun comes up. Anything for the students, though! If you’re looking for me, I’m probably in the Student Life Center hanging out with the Admissions team. I love that each day is different, and I get to work with creative people across the campus. I also love teaching and seeing things through my students’ eyes. The best part, though, is when I see how my work makes students proud they chose Ivy Tech. What’s your favorite thing you work on at Ivy Tech all year? Commencement is my favorite event. It takes an army of Ivy Tech employees to make it happen and it is hours of work and stress, BUT I get a front-row seat as the sea of students walk out the tunnel in their caps and gowns. It’s the moment it all becomes real, and they realize they actually did it. Watching them enter that room as students and leave as graduates—there’s nothing better in the world. Except maybe sitting down after that 14-hour day. Aja is always looking for help to plan the logistics and promotions for events. It’s a detail-oriented, creative job. If you think you’d enjoy it and want to learn about intern possibilities, email her at amichael8@ivytech.edu. This entry was posted in Green Light, Who's That?. Bookmark the permalink.